Focused ultrasound surgery is a potential noninvasive surgery for eliminating leiomyoma. In this clinical image, we introduced an alternative role of this method for cases of multiple leiomyomas and huge leiomyoma with effective outcomes. A nulliparous 30-year-old patient with a history of uterine leiomyoma complained bulk effect of pelvis admitted to the Department of Gynecology. Magnetic resonance imaging examination revealed that there were 15 uterine leiomyomas affected almost areas of anteflexed uterus considered as all Type II uterine leiomyomas (the signal intensity of leiomyoma was greater than that of skeletal muscle and less than that of myometrium) [Figure 1]a. The perfusion classification of uterine leiomyomas was regarded as Type A uterine leiomyoma (the time signal intensity curve of uterine leiomyoma was less than that of myometrium) [Figure 1]b. The patient was indicated single-phase focused ultrasound surgery (FUS) under the guidance of magnetic resonance imaging. After 144 min of treatment duration, nonperfused volume ratio of this case was 98% [Figure 1]c. At 24-h posttreatment, the patient was discharged without adverse events. At 6 months of follow-up, all leiomyomas were shrinked with total mean volume reduction ratio of 52% and the pelvic tension symptom was resolved entirely [Figure 1]d. In addition, anti-Müllerian hormone level before ablation and after 6 months of follow-up was preserved comprehensively. A nulliparous 28-year-old patient with a history of leiomyoma suffered from urinary retention and pelvic pressure admitted to the Department of Gynecology. On the physical examination, clinician found a big palpable mass on the pelvis. On T2-weighted image, there was an intramural leiomyoma located on the anterior wall of retroflexed uterus with diameter of 151 mm considered as a Type II leiomyoma (the signal intensity of leiomyoma was higher than that of skeletal muscle and lower than that of myometrium) [Figure 2]a. On perfusion-weighted image, leiomyoma was regarded as a Type A leiomyoma (the time signal intensity curve of leiomyoma was lower than that of myometrium) [Figure 2]b. The patient desired to undergo FUS instead of open surgery. The FUS under the guidance of magnetic resonance imaging yielded a nonperfused volume ratio of 91% [Figure 2]c. At 12 h postablation, the patient was discharged without side effects. At 6-month follow-up, the diameter of leiomyoma was reduced to 82 mm, and the complaint symptoms were resolved completely [Figure 2]d. In addition, serum anti-Müllerian concentration of this case before ablation and after 6 months of treatment was preserved entirely. Leiomyoma is one of most common gynecological benign diseases that influence adversely on the health of the reproductive age patients. The prevalence of leiomyoma is approximate 70%–80%. FUS was based on the biological thermal effect of high-intensity focused ultrasound on the convergent tissue to elevate the tissue's temperature up to the threshold of coagulative necrosis and protein denaturation.,,,,, In this clinical image article, we displayed a case of 15 leiomyomas and a case of huge leiomyoma treated in single phase FUS successfully without any side effects. These results were fully agreement with some previous studies;,, therefore, FUS treatment should be considered as an alternative therapeutic method for patients with multiple leiomyomas and huge leiomyoma. The authors certify that they have obtained all appropriate patient consent forms. In the form, the patient(s) has/have given his/her/their consent for his/her/their images and other clinical information to be reported in the journal. The patients understand that their names and initials will not be published and due efforts will be made to conceal their identity, but anonymity cannot be guaranteed. Funaki K, Fukunishi H, Funaki T, Sawada K, Kaji Y, Maruo T, et al. 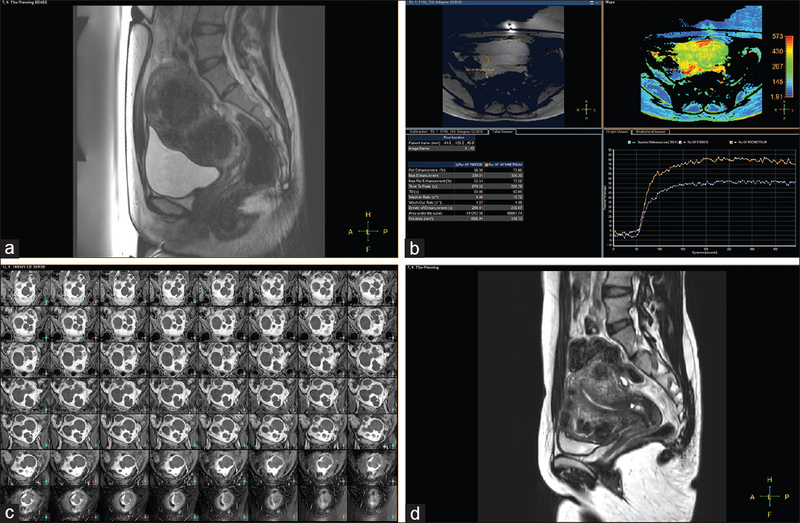 Magnetic resonance-guided focused ultrasound surgery for uterine fibroids: Relationship between the therapeutic effects and signal intensity of preexisting T2-weighted magnetic resonance images. Am J Obstet Gynecol 2007;196:184.e1-6. Keserci B, Duc NM. The role of T1 perfusion-based classification in magnetic resonance-guided high-intensity focused ultrasound ablation of uterine fibroids. Eur Radiol 2017;27:5299-308. Lee JS, Hong GY, Lee KH, Kim TE. Changes in anti-müllerian hormone levels as a biomarker for ovarian reserve after ultrasound-guided high-intensity focused ultrasound treatment of adenomyosis and uterine fibroid. BJOG 2017;124 Suppl 3:18-22. He M, Jacobson H, Zhang C, Setzen R, Zhang L. A retrospective study of ultrasound-guided high intensity focussed ultrasound ablation for multiple uterine fibroids in South Africa. Int J Hyperthermia 2018;1-7. [Ahead of Print]. Doi: 10.1080/02656736.2017.1421323. Kim YS, Kim JH, Rhim H, Lim HK, Keserci B, Bae DS, et al. 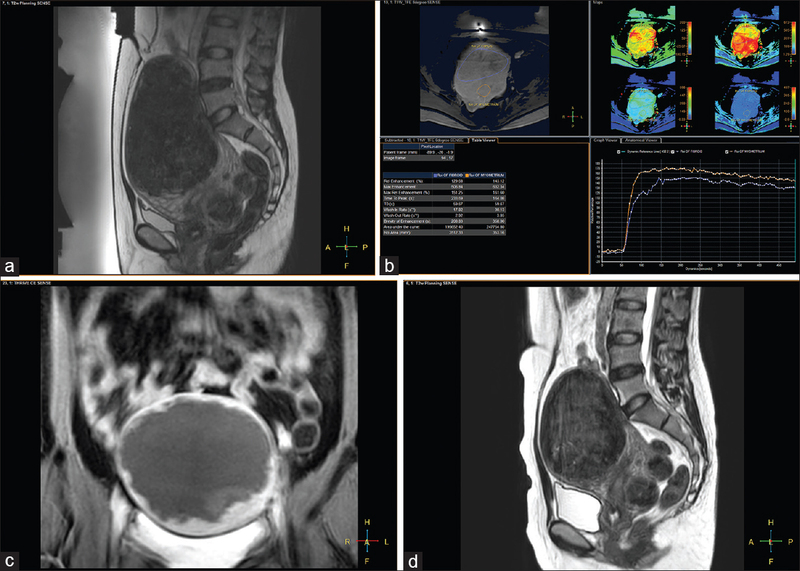 Volumetric MR-guided high-intensity focused ultrasound ablation with a one-layer strategy to treat large uterine fibroids: Initial clinical outcomes. Radiology 2012;263:600-9. Hou R, Wang L, Li S, Rong F, Wang Y, Qin X, et al. Pilot study: Safety and effectiveness of simple ultrasound-guided high-intensity focused ultrasound ablating uterine leiomyoma with a diameter greater than 10 cm. Br J Radiol 2018;91:20160950.